Parts included: 2- Stainless Steel metal precision cut bars, 1- Promoter packet. 1. 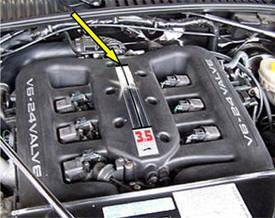 Wash the engine manifold cover in the center with soap and water. Let dry and rewash with thinner to remove any oils that may be on the manifold. This is important; the stainless steel strips will not bond well with any oil on the engine letters. 2. Take one the two metal strips and set them on top the manifold and see how they are to be positioned. Once you are comfortable with the fit it is time to mount them. 3. Take the moist towelette out of the Promoter packet and wipe down the area to where the strips will be mounted. 4. Remove the backing from one strip and carefully set it on top the engine manifold exactly where you want it mounted. Press down firmly along the entire length of the strip. Repeat this process with the second strip. Let set over night before driving. Keep clean by simply wiping with glass cleaner or a good stainless steel cleaner.